OK I needed a gas mask for this job. Would you use the same sweaty towel for 6 months without washing it? 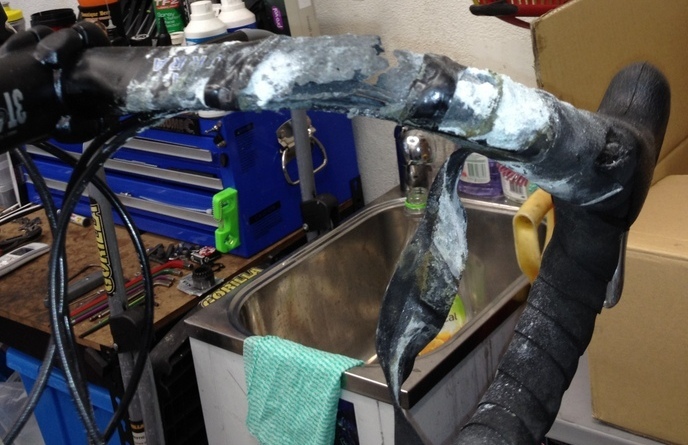 Many customers bring their bikes into us for servicing, and removing the bar tape is sometimes down-right putrid (salt, sweat, and awful smell), and an occupational health and safety issue to us from a hygiene perspective. The photo above illustrates the extreme corrosion from sweat on bar tape that hasn’t been replaced. The corrosion led to a snapping of the handlebars. If you don’t change your bar tape regularly, remember that when you eat on your ride, you are using the same hands that have been on your unhygienic handlebars. change your bar tape every 3 months if you ride regularly, every 6 months at the absolute latest. in between bar tape changes, wash your bartape with soap and water.